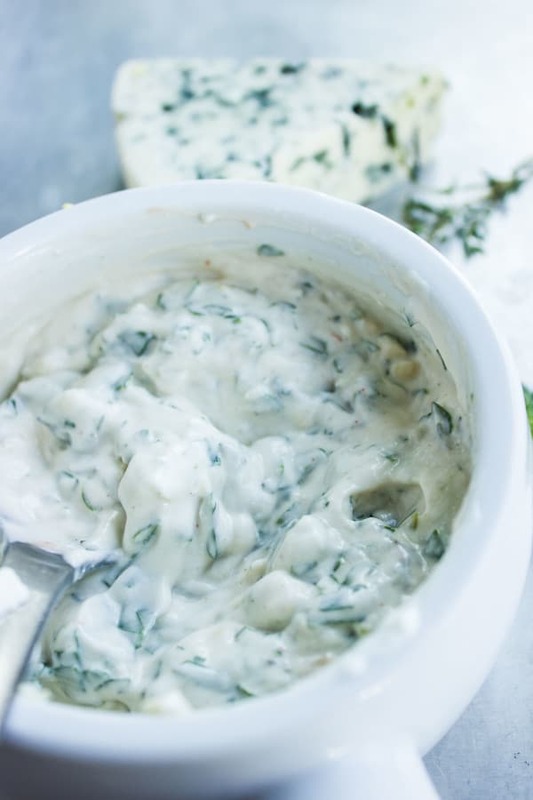 This easy garlic blue cheese dip is light, smooth and creamy thanks to sour cream. Fresh parsley, thyme and a squeeze of hot sauce take this classic cheese dip to the next level. 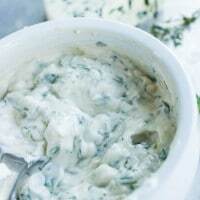 This garlic blue cheese dip recipe takes 2 minutes, few ingredients and makes an incredible dip for blue cheese lovers. 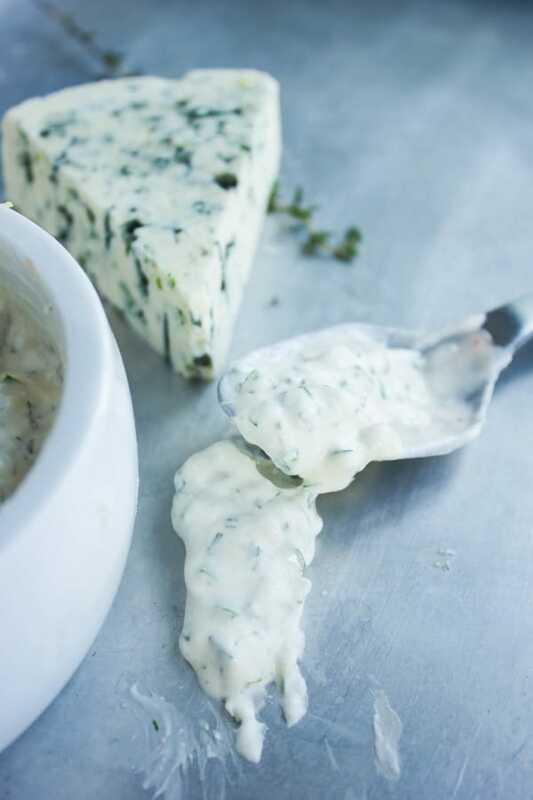 It’s made with sour cream for a smooth and creamy texture and seasoned with parsley and thyme. A touch of hot sauce adds a hint of spice! Keep it in the fridge for up to 2 weeks, if it will last that long! My husband got me hooked on blue cheese. He is a die-hard blue cheese guy. I had nothing against blue cheese before, but I never missed it if it wasn’t there. Now I would miss it if it wasn’t with my spicy wings or chicken fingers, or with my steak or salad. I love making my dips as simple, fresh and light tasting as can be. So for that light, fresh taste I use sour cream instead of mayo and I still get a smooth creamy texture. I also love adding fresh herbs like fresh thyme and parsley. Then I add garlic for that deep flavor to compliment the blue cheese and hot sauce to spice it up. For convenience, I mash up all the ingredients and whisk them in a bowl with a fork by hand. Of course, you can totally whip this up in a food processor for a smooth velvety whipped blue cheese dip texture—which is my husbands’ favorite. Taste the dip and adjust seasoning. 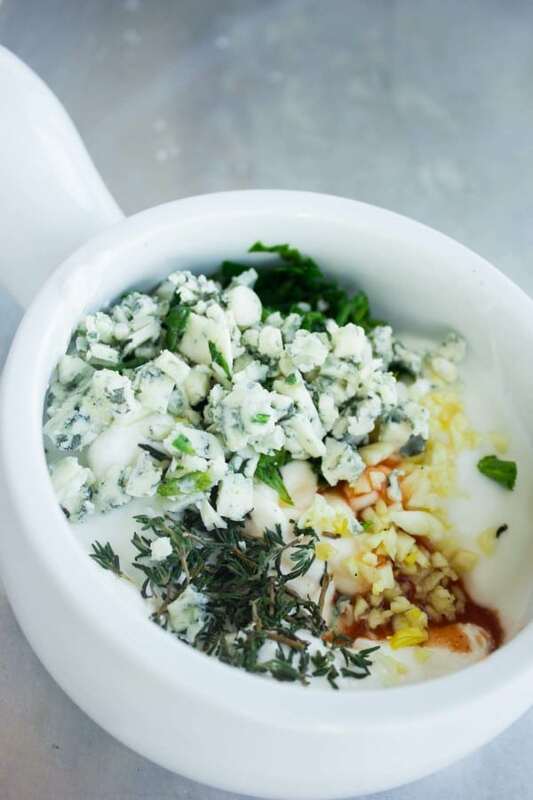 Adjust consistency by adding more sour cream for a thinner milder dip or more blue cheese for a thicker stronger dip. For an extra smooth texture, blend the blue cheese dip in your food processor. I simply mash all the ingredients with a fork. This easy dip keeps for at least 2 weeks in the fridge and if you’re a blue cheese person too, you might want to double, triple or quadruple this recipe and have a secret stash in the fridge. If you dilute the dip with a little bit of vinegar, you got yourself an awesome blue cheese salad dressing! If you thin it out with extra sour cream, you can use it as a sandwich spread. Serve it along veggies, chicken, meat, bread and enjoy! 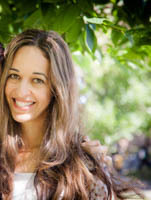 For more blue cheese recipes, check out my Pilly Steak Sandwiches and my Honey, Fig and Blue Cheese Crostini! Place all the ingredients in a bowl and mash with a fork. Or for a smoother whipped consistency, place the ingredients in a food processor and pulse until smooth. Taste and adjust seasoning. Adjust consistency by adding more sour cream for a thinner milder dip or more blue cheese for a thicker stronger dip. 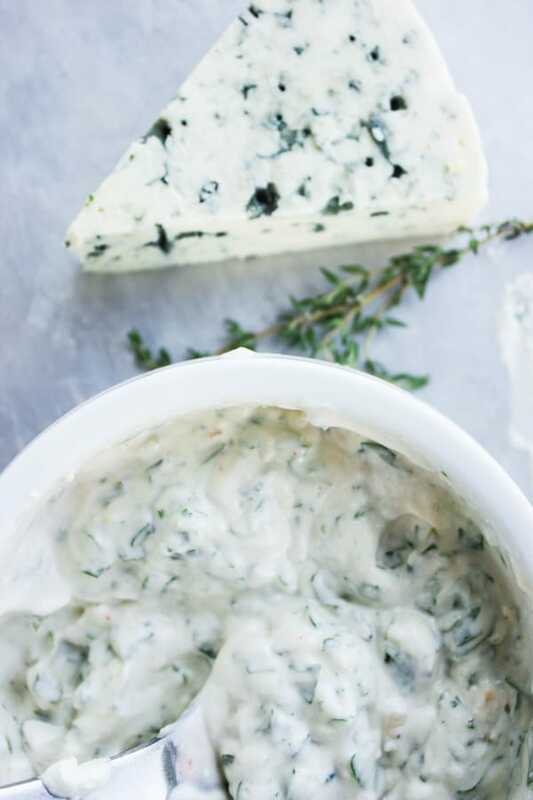 This blue cheese dip keeps for at least 2 weeks in the fridge and if you’re a blue cheese person too, you might want to double, triple or quadruple this recipe and have a secret stash in the fridge. Guess I am gonna get hooked to this dip … It’s beyond delicious!